Petty Crime in Yerevan: A Growing Trend? Yesterday Hetq Online filed a report stating that four European tourists had been attacked and robbed during the last week. The victims included two people from the Czech Republic and two Dutch tourists. Luckily the assailants were found and many stolen items were recovered. Nevertheless, those foreigners are unlikely to visit here ever again, and their told stories will dissuade countless others to vacation in Armenia. This is not the first time I have heard of foreigners being harassed and robbed. A couple of years ago the chef of the now-defunct “New Delhi” restaurant was hassled and then forced by his muggers to withdraw the equivalent of $3000 in dram from an ATM machine. As a result he was obliged to leave Armenia for his home in Nepal, nearly penniless. I think he earned enough to buy a plane ticket and pocket money, then left the country. Even officials are getting into the harassing act. Back in March Abraham Manukyan, the Deputy Health Minister, was charged with creating a public disturbance, defined as “hooliganism,” in front of a restaurant in downtown Yerevan where he, his son and others who were all drunk bothered people walking by. Three people were even assaulted. Tourism has been on a decline around the world and Armenia’s tourism business is no exception. Hotel prices in Yerevan are extraordinarily high compared with those in Georgia and Eastern European countries. Restaurants are becoming increasingly expensive it seems as well, with the number of posh, trendy dining establishments offering “VIP” seating sections on the rise. Affordable, modest places to eat are falling by the wayside. Excursion packages into Armenia’s regions seem to be fairly reasonably priced, but they can always be made more affordable in an effort to increase the number of tourists. On the contrary, prices are increasing. And now, on top of the ridiculously high costs, foreigners have to worry about being beaten up and robbed when they come here, if they every do. Lately I have been wondering whether I would ever be mugged while walking around the city center in the evening. I usually stroll around as late as midnight or even later. The mafia life is not only beneath the surface of society at large, it has already slipped into the consciousness of the populace. There are at least four television programs (one of them on state-sponsored Public Television strangely enough) glamorizing criminal life. One of them, called “The Price of Life,” which is very popular, is rebroadcasted several times a day on Armenia TV. Teenagers are undoubtedly watching these programs and some, like the punks that mugged the Europeans last week, are aspiring to live that kind of life. I think the days of being able to safely walk the streets at night in confidence may be coming to an end. But I hope I’m wrong. Then she added that the recent warming of relations between the Armenian and Turkish leaderships, along with the lack of participation on the part of Nagorno-Karabagh’s authorities in the peace negotiations, were worrisome. She also went on to make some other interesting points about Armenian culture and society, regarding how Diasporan Armenians are striving to protect their identities. She also expressed her dissatisfaction with the Ministry of Diaspora of the Republic of Armenia, the exact undertakings of which are still totally unclear to me and I bet thousands of other diasporan Armenians as well, including Arsinée. She brought up the example that films about the Armenian Genocide should be made in Armenia, that the medium of film should be used to make Armenia known under the world spotlight and later, to make demands for justice, just as Israel has been doing. Naturally I agree with all of her points. I think the warming up in relations with Turkey and the seemingly eager willingness on Armenia’s part to appease the West by agreeing to make concessions for peace with Azerbaijan are unwise unless Armenian demands are met first and foremost. Also, I can’t imagine the Ministry of Diaspora serving any kind of tangible purpose other than actively pursuing and persuading Armenians to return or else move to Armenia for the first time from their countries of origin. And as a strong advocate of the arts, I concur that the Armenian film industry should be drastically developed in order to help promote Armenians and their cause on the world map. Dozens of grotesque, monolithic newly constructed buildings are not signs of societal development in my opinion. Armenia certainly still has a long way to go to make its place in the world. The original article which was written in Armenian can be found here. I just read a disturbing Hetq report about five people living in an underground shelter for eight years in Ashtarak who supposedly went unnoticed by local residents and the authorities. 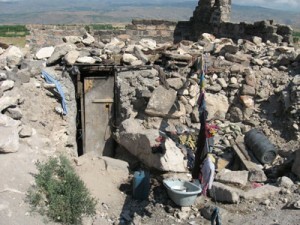 Based on information reported by Aida Papoyan, a resident of the town of Ashtarak, and teachers of the town’s #1 Special Dormitory, staff at the Aragatzotn Regional Authority’s Children’s Rights Division uncovered the fact that Hakob Harutyunyan, along with two women and their two children, were living in an underground hut that belonged to Mr. Harutyunyan. The two women and children are not related to Mr. Harutyunyan. One of the women who have taken refuge in the underground shelter is named Armineh and the other, Anjela. Staff members of the Regional Authority (RA) visited the site. What I want to know is–what the hell was going on there? This guy, Harutyunyan, had two houses in the past. He sold his two-story house to buy a smaller home, then sold that to live instead in a “hut” that he dug, on his very own land! Hetq claimed that “He later sold this as well and then started to dig a hole in the corner of his land. He encircled the hole with stones and has been living in it for the past eight years.” What is that all about? Didn’t the people who bought his house find that odd? How could they have been oblivious to that, and moreover, how could they have accepted the situation for eight years? How did this happen? It is extremely cold in Ashtarak in the winter–you have to contend not only with the snow but also with the alpine winds blowing from Mt. Aragats. To keep warm in that hell-hole they had to have been burning something in some sort of stove, which means there must have been ventilation there to allow billowing smoke to exit the shelter. In other words, where there’s smoke, there’s fire, and thus there’s no reason to believe that nearby residents were clueless about the families with Harutyunyan as the “head” living there. How could they have possibly survived for so long? The Hetq report read that in living literally underground Harutyunyan “bowed under the pressures of daily life,” whatever that’s supposed to mean. Furthermore, after his mother died, who was also living in the hut, he left her there to rot with them for three days before relatives came by to take her body and make funeral arrangements. Then the relatives presumably walked away from Harutyunyan, knowing quite well what state he and the others were in. You can’t dismiss the fact that those people were cold and heartless, and they should be held responsible for being accomplices to ignoring this horrendous situation. Just from the few points the article made about Harutyunyan, it is obvious at least to me that he’s suffering from some kind of mental illness. Nevertheless, Ashtarak’s social services department should have been on top of the situation and provided him as well as the other children and women living there with both social and psychological treatment. Armenia is a small country with around 3 million people–probably significantly less although this is not officially discussed. Because society is so compact, civil society and the Armenian governmental authorities must make sure that every single one of its citizens–identification papers to prove as such or not–must be able to live decently in proper living conditions, with dignity and with some sort of monetary stipend if they cannot find employment for whatever reason. It is not realistic at all that some people can fall through the cracks and not be accounted for. There’s no excuse for allowing anyone to live miserably in this country, no matter what circumstances led such unfortunate people to their fate. In every rural Armenian community, no matter how large or small, everyone knows one another. They know all about each other, what they’ve been up to, and where they are now. That’s the way it is in Armenia, you don’t fall off the face of the earth under people’s noses. In other words, whereas in Soviet times neighbors were brotherly towards one another and took care of each other under the protective canopy of socialism (Armenians and Azeris were living side by side in harmony for instance in villages throughout the Ararat plains), now you have people living in fear of speaking out against horrors their neighbors face. Maybe they’re scared that they will be oppressed by the authorities for not bringing the matter to their attention sooner, or maybe they simply don’t care. I think in this situation you can’t really say unless you dig deep and persuade people to talk. And in this case, the first person who needs to be doing quite a bit of explaining is Harutyunyan. Will A Peace Framework Be Signed? Today Armenian President Serge Sarkisian is flying to Moscow to meet with his Azerbaijani counterpart, Illham Aliyev. On the meeting’s agenda is coming to terms with some sticky points based on the so-called Madrid principles revealed in November 2007 that the Minsk Group mediators representing the US, France and Russia have so vehemently insisted be put into place. There is speculation that the presidents will sign some kind of document attesting to oblige by the principles this afternoon. The authorities of Nagorno-Karabagh categorically reject the legitimacy of these principles and resent having been shut out from participating in the talks. Armenian political parties like Heritage and the ARF-Dashnaktsutiun are threatening to call for President Sarkisian’s resignation if a document is signed today. What’s going on here? Will President Sarkisian indeed agree to sign a framework agreement based on the above mentioned principles? The points in this document basically favor Azerbaijani territorial integrity and essentially illegitimize everything the Armenians have fought for as well as defended regarding the integrity of the people of Nagorno-Karabagh, and even Armenia for that matter. Agreeing to these principles seems to be a defeatest measure on Armenia’s part. But is President Sarkisian indeed a defeatest, or is this simply a chess match he’s playing? Seems like there are conflicting reports about the circumstances leading up to the death Nazareth Berberian, who was a Armenian-American Philanthropist and businessman. He was most recently developing a hotel that was to be constructed on the corner of Pushkin and Abovyan Streets in Yerevan. On April 25 he went missing, and his dead body was found in a ditch about 25 kilometers north of the capital. The police say that only one culprit was involved in the kidnapping and murder of Berberian, while there is reason to suggest otherwise. Even though his body was found on May 15, the police placed the date of death on April 25. It is likely that he was actually kept alive and tortured for several days, as there were signs to indicate as such when his body was recovered. There are still tests being performed from an autopsy in Los Angeles where Berberian’s family was based, which will hopefully shed some light as to when exactly was the time of death. Berberian had no known enemies or conflicts with individuals in Armenia. Nevertheless, there is speculation that several individuals were involved in his abduction and subsequent murder. Petros Temiryan, 35, was arrested and charged with killing Berberian by strangulation. The police claimed that Temiryan killed Berberian after stealing $10,000 worth of belongings. But according to Ara Manoogian, who is leading the effort to independently investigate Berberian’s death, the police investigator into the case revealed that the suspect was beaten to force a confession to the crime. But just because the suspect was beaten to confess, that doesn’t mean he wasn’t in fact involved. So what happened? People close to Berberian think that there is a police cover-up as to what really transpired, while the police insist that only one person was involved in Berberian’s abduction and brutal killing. Something isn’t right. But who’s really at fault here?